It's summer time, ice cream beckons. You may as well head for the best there is. On my chocolate tour of Tuscany and Piedmont I inevitably learnt about and tasted much that was not chocolate. 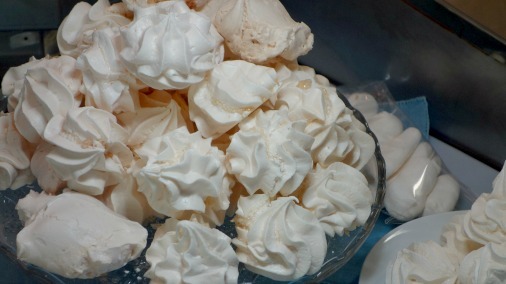 The chocolatier and the pastry chef are members of the same family, and as such often live under the same sweet roof. 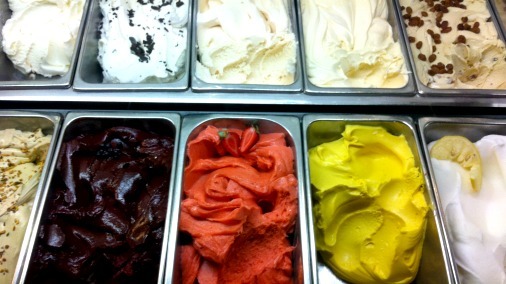 And an essential part of any exploration of Italy’s sweet food culture is gelato. You cannot move for gelateria, and every Italian will swear blind that they know the very best in the city, if not the country. Bar a few rare exceptions, all the gelato in Italy is a quantum leap in the right direction from the ice cream we know in Britain. 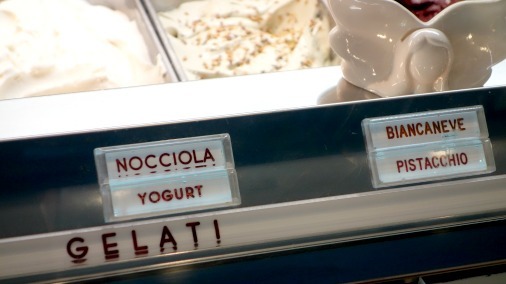 When you visit one of the celebrated independent gelateria you step up a notch further. When you set out to visit the favourite of Italian chocolate and taste expert Monica Meschini, expectations start to soar pretty high indeed. An unassuming shopfront masks what wonders await you. 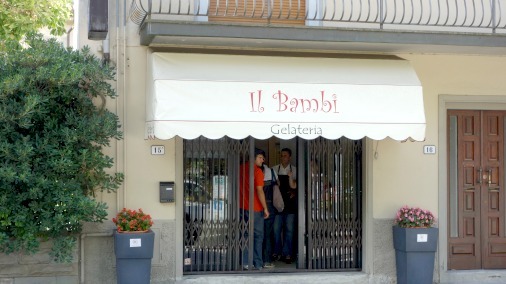 Il Bambi is the creation of the Gherardini family, in business for more than forty years, and now presided over by Igor Gherardini and his sisters. It sits at the edge of a leafy square in Pistoia. 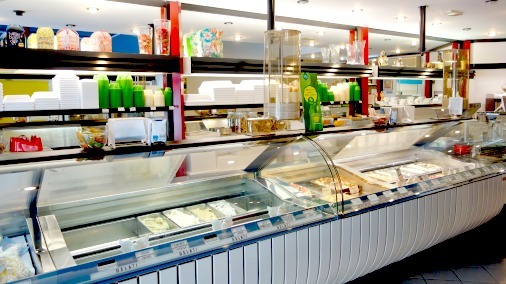 The shop itself is clean, attractive, dominated by the steel and glass banks refrigerated serving counters. There are a couple of chairs to sit on if you don’t wish to take away, and a large upright fridge with gelato cakes for parties. But there is nothing ostensibly to indicate that you are in the presence of greatness. It is much like many a gelateria. 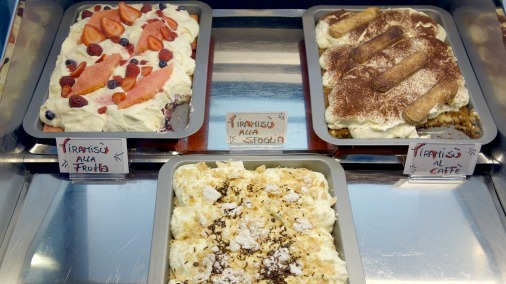 But Igor has a passion – rigorous attention to detail and delight in his creations that was a joy to see – which has resulted in peerless gelato. Every single flavour I tasted was the best of its type. There are usually thirty flavours in rotation, a core of twenty classics, and scope for him to experiment and keep himself and his customers interested. He made a special pear, Gorgonzola and walnut for Monica and I to try. This new recipe balanced the sweetness of caramelised pear with the crunch and toasted flavour of walnuts, and the acidity and slight savoury edge that typifies a good cheesecake. It was very good, destined to be a future classic I would say. Igor with the Pear, Gorgonzola and Walnut. The recipes are stunningly well thought out and executed. Ingredients are only used when they are at their seasonal best. Strawberries are a mountain variety grown nearby, specially cultivated a metre above ground, which produces a healthy fruit intense in flavour. The blueberries are a wild variety from the Pistoia Mountains, with a particularly clean intense taste. Mangoes are only used when Alphonso mangoes are in season. Each fruit is treated according to its nature; the lemon is lemon, water and sugar, nothing else, ultimate purity. The mango is made into an ice cream, the addition of milk complimenting the very creamy nature of the fruit and evoking the Indian desserts of the fruit’s natural home. Getting into fruits (for more see above). Igor studied agriculture, and his wife sells plants, so many of the fruits and herbs they use are from their own gardens. Evidence of this is to be found in the mint ice cream, the smell of which is like sticking your nose in a mint plant. The attention to detail is also evident in his use of chocolate – chocolate ice cream of course being one of the most important classics. There is a gianduia ice cream, which remakes that Italian chocolate classic combination of chocolate and hazelnut in ice cream form. And there were also two plain chocolate ice creams to taste on my visit. 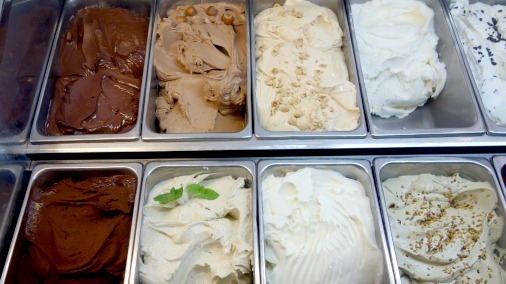 One is a 50% milk chocolate gelato; the other is a 75%, much like a sorbet as it has little milk. He makes a dark chocolate with whipped cream for winter, when things get creamier, and white chocolate makes an appearance as a compliment to the tartness of raspberries in the summer. He has also made a sorbet using Pacari chocolate for an event, which was hugely successful and remains in his repertoire. In the presence of a master it was an easy sell to get me to taste every single flavour in the shop, and I would run out of complimentary words long before I had described half of them. Zibibbo is Monica’s favourite, a divine reinvention of the rum and raisin of my childhood, a full flavoured but light custard and plump sweet raisins. I would be hard pushed to pick a favourite from the wide range of classics and more innovative recipes he lovingly concocts. I think probably the ‘panna gelato’, a very pure recipe, this is rich in the delicious caramelised milk warmth that Igor achieves through his refusal to use any powders or pasteurised products in this gelato. Instead he stirs at length in a vast bowl-shaped copper pan, which mellows and deepens the milk flavour. Igor with his essential copper pot. Beaming while showing me the very pan in which he summons up this magic I realised quite why this gelato cannot be bettered. It is a cliché but the answer is love. 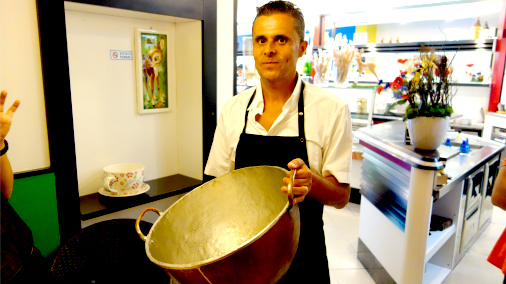 Igor has been making ice cream for twenty years, and he tells me about it, waits for my responses as I taste each one, and cradles his copper magic cauldron with absolute pride and enthusiasm. 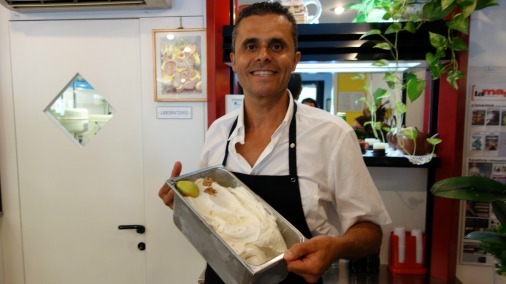 He says he loves making ice cream every day and it is his greatest “pleasure to see the smile on people’s faces as they eat it.” How rare, how it has driven him to make his gelateria a shining example of delicious excellence. 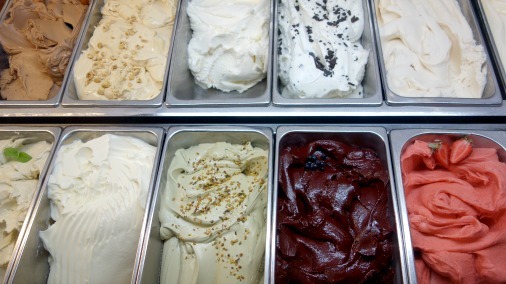 Monica’s choice for the best gelato in Tuscany has a LOT of competition for that accolade. But I have truly never tasted better. You will have to make the pilgrimage one day. In the meantime take a leaf out of Igor’s book and make some yourself, with a big smile on your face. Now where did I put that chocolate sorbet recipe?